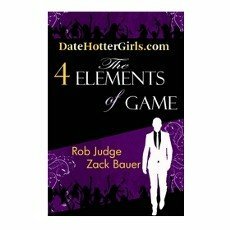 Review for The 4 Elements of Game, 'Game' Simplified. Sticks to the Important and Makes Highly Practical. "'Game' Simplified. Sticks to the Important and Makes Highly Practical." Very practical. Sticks to priorities. Simply related. Excellent value for money. Great for kicking guys who have read a lot of advice but not got results into shape. Good value for money. Simple to understand. Very practical advice. Suited for beginners and also for guys who are intermediate and feeling cluttered with dating advice. This was a refreshing read. Refreshing for its simplicity and careful prioritization of the things that really matter when you are learning to get better with women. From start to finish Rob takes you through the most important things he sees in dating women. They have kept it to a small number, and they are careful to tackle the most important first. They said it - in a community of men studying to get better with women - no one talks about the biggest reason for men not getting results. They don't put it first, they don't give it the priority it deserves. Rob and Zack said it. Drive... (another word for stepping up and pushing things forward with women). The 4 Elements of Game dedicates the first quarter of the book to inspiring you to focus on drive before everything else, and telling you how to do it. I salute them - it had to be said like this. And they do it well. It's all in the words... Rob, the write of the book, reveals that he is a writer at one point in the book - and this doesn't surprise me. His use of words, and naming of concepts throughout the book have obviously carefully been chosen. "Oversell everything in you life but nothing about yourself." For those who have read a lot of dating advice, you'll know that this sums up succinctly a lot of what you've learned and read about communication. Reading through the book it was obvious to me that these guys have spent a lot of time meeting and dating women. They get it, and have been able to translate all their experience into practical - short advice. An example of the practicality of the book, is the use of 'conversation templates' for you to use. There aren't that many of them, and to be honest it is stuff I and many guys have either known or read about for a long time - but... they have translated that knowledge into a few templates which make it easy to follow. Something else that Rob does well in this book is relate to the reader. He builds both him and Zack up at the beginning of the book, and later.. throughout the book he gives you well chosen stories to illustrate points. Many of these are screw ups where Rob and Zack learned their lessons. Many guys will see themselves in these situations. I was glad to see that the traditional barrier that Dating Coaches put up of being semi-perfect wasn't here. You can get a better feel that these guys are just like you, and they've had, and still have their screw ups. But, that it doesn't stop them from getting the success with women they have searched for. I liked this authenticity and think it will help guys by making it all more approachable and accessible for the typical guy. They tell it like it is when it comes to mistakes. They happen, and they don't completely disappear one day by a miracle. But it's no big deal. The writing style is also has a fun vibe. So it isn't a tough read, it's pretty enjoyable. I haven't come across dating advice before that has taken a good stab at customizing the advice for the student. The reality is that every student is different, and that he has weaker and stronger parts of himself (naturally) that are effective to attract women. So when someone learns from dating advice there is a risk that he will over emphasize something that he was actually already ok at. And the truth was he needed to focus on developing another part of his skills. The 4 elements of game tries to address this through the idea that balance between the 4 elements is what you need to achieve. They explain and give examples of how a guy can be good in one area and need to work on another area to balance it out and get good. This is an important point, and many students get advised on dating bootcamps about these issues - but this is the first homestudy product I've seen that attempts to address it. Good job. I like the 'balance' system Rob and Zack propose. And I think it will help a lot of guys to get over their weaknesses. The book would've gone that much further if they had spent some time helping a guy to identify what elements he has to work on more in a clear process. A great point of the book is its clarity and simplicity, but this aspect didn't get the same treatment. Some guys may come away from the book with less than they could because they are unable to identify their own particular weaknesses. The section on storytelling broke with the mould of the rest of the book and got kind of complicated, with quite a few rules and - basically, it just wasn't something you were going to implement easily and quickly. Unlike a lot of the books content - which kept to that rule. I also felt they were 'over-reaching' themselves a little in this section - like they didn't 100% know how to teach this particular aspect of their dating system. If you are someone who has read a lot (read: too much). And your results have not followed, you are at a learning 'trough' that many many guys fall into. They confuse themselves with too many different approaches and concepts. The resulting clutter in your head breeds inaction. This is a serious issue for guys learning dating advice. I think this book, right here, could be the solution for those in that situation. This book reduces to simplicity a lot of the complexity. It may not be the perfect guide to dating women, but it certainly hits the 80/20 of it. The important stuff is covered and handled. If you are feeling cluttered by dating advice for men, I recommend you try this one out to clear up the mess. This is a good book. It is simple to understand and offers very practical advice. This is well suited for beginners, so they don't over-complicate things - and also for guys who are intermediate, and are feeling a little cluttered with dating advice. This book is definitely good value for money.